A striking jacket from Joseph Ribkoff- black with multi colored striping that creates an interesting ribbed texture. Featuring a cowl neckline, three-quarter length sleeves, wraparound cut and hem hitting just at the hip. Single button closure at the neckline. Model is 5'10"/178 cm and wears a size 6. 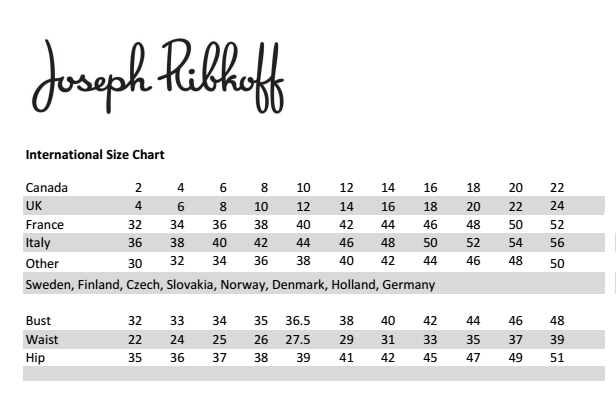 JOSEPH RIBKOFF’s reputation is built on the innovative versatility, affordability and quality of their womenswear collections along with their unmatched excellence in customer service. All clothing is designed, sewn and produced in Canada (Dorval, Quebec), which is a remarkable feat in today's fashion world. Joseph Ribkoff produces Versatile dresses for all occasions, day or evening, eveningwear for all formal occasions, separates and related sportswear line that offers our customers the trendy items not found elsewhere.